Resident Belleek designer Frederick Slater designed the Daisy Vase in the 1890's. One day as he looked out the window of the Pottery, which overlooks the River Erne, he saw a little girl picking Daisies. He sketched her and he noted the way she clutched the Daisies, the shape of which became the design of the vase. Many years later the popularity of the vase led Belleek to expand the range, making the present Daisy Collection. 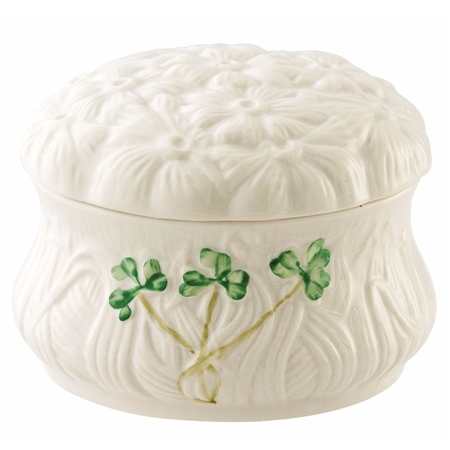 This beautifully embossed trinket box would make the most perfect gift, to be treasured for years to come. The Daisy Trinket is ideal for holding jewellery, or adding a special touch by giving jewellery in a handmade box. I fell in love with Belleek as a young girl while watching my mother's collection grow piece by piece, and learned to appreciate it even more after touring the Belleek factory while in Ireland. I thought the Daisy Trinket Box would be a wonderful addition to my own growing collection and was not disappointed! It is beautiful and the same quality I've grown to expect. I have also purchased several more Daisy Trinket Boxes to give as Christmas gifts to the rest of my family. Thank you!